I am so excited about this autumn, there are some lovely things happening. 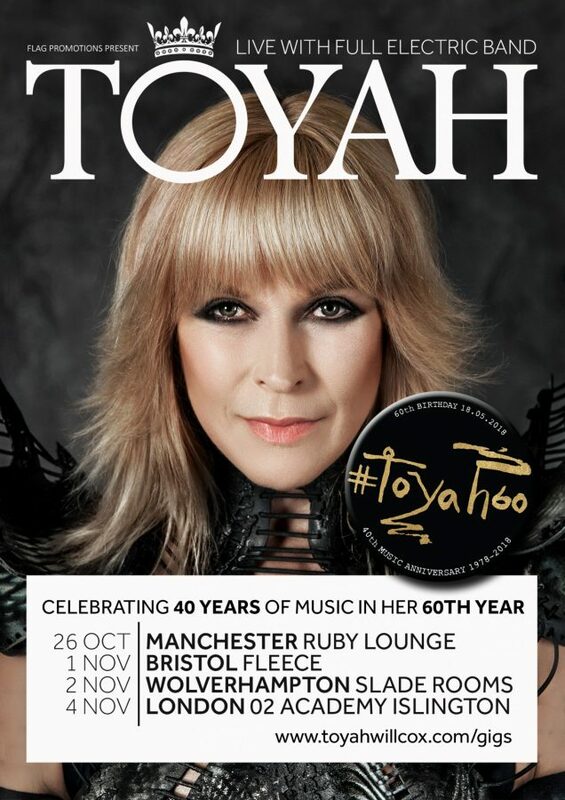 The TOYAH 60 electric shows are shaping up into something pure TOYAH. We are bringing into the set list some of my all time favourites and adding new material too. Ironically the TOYAH acoustic show has taught me so much about my own songs. If a song works in the acoustic setting then it will work in any format, but the major lesson the acoustic show has given my team is that volume is not necessarily a friend to music, for example ANGEL & ME only works acoustically, it has never worked in the electric context without sounding like a shapeless thrash, so we are bringing the acoustic elements into the autumn shows to honour the songs that must be included in the set like Angel & Me. Space and harmonic placing is more important than noise. Now all the front line of the band sing it has made a huge difference as well, to meaning and emotional colour. LOVE IS THE LAW features a lot in the new show, my fave album. I am really looking forward to O2 Islington where the cast of Jubilee are seeing me in my natural environment for the first time. It’s a year since starting work on Jarman’s play……wow that has gone soooooooo quickly and I miss the team a lot. Also at Islington Simon Darlow is joining us on stage for the Love Is The Law and Crimson Queen songs, I believe he has acquired a 1958 Gibson especially. 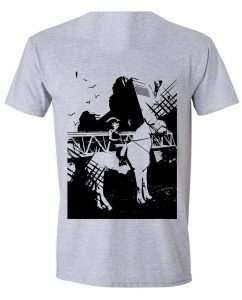 We also have a fab new BRAVE NEW WORLD T-shirt and some other other special TOYAH 60 merchandise too. Did I ever mention the e-mail that said “ I see you are playing Leeds tonight, could you pop by Penzance and wish my husband Happy Birthday. You don’t have to stay, just do it at the front door and leave.” !!!!!!!!!!!!!!!!!!!!!!!!!!!!!! My husband is about to leave on tour for 2 months. I will be meeting up with him in Tokyo in December. We are scheduled to be home on Christmas Eve. Next week Bill Rieflin is with us, so he can recover from jet lag before the King Crimson rehearsals start in the UK, so as both my boys are missing the run up to Christmas I have put all the decorations up and wrapped the presents. Yes, as I write this on October 6th our house looks like a Christmas Grotto! I love Halloween, but I don’t want to see it in my house, so Christmas is acting as a buffer against all the ghouls! Last month all the QUADROPHENIA team got back together for a documentary on Sky Arts for next year……QUADRO’s 40th Birthday! Even Sting, Ray Winston and Tim Spall have all taken part. 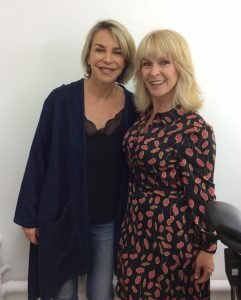 It was fantastic to see Leslie Ash looking gorgeous with the rest of the team, we are all good friends so every occasion that brings us together turns into a social! If ever a film deserved celebrating this is the one! Every decade it has won new audiences and affirmed teenage angst and rebellion are a right of passage. Next year exciting plans are in motion. This Sunday we all meet up again at a secret location in London to plan and party. Not everything in life is exciting. September was more Lawyers than music. Robert and I updated our “wills”. I am determined not to leave anyone with the mess my parents left us with, death was the elephant in the room right up till their passing. Nothing was in any order. So “wills” done, then on to Pensions! YIKES! I am so not ready for this word! Retirement holds no appeal but I have a pension that has been in existence for 40 years………..So the big question last month “when do I want to draw it?” so in my usual innocence I say at 66….next question till WHEN? My logic is pretty straightforward and I thought this was a bloody stupid thing to ask but it appears you have to set an end date that hopefully you will die before hitting. I suggested 90, as I am sure my 70’s will be the end of me. The advice back was set it till the age of 110!!!!!!!!!!!!!!!!! REALLY? Yes people are living till 110! God I am going to be soooooooooo bored if life drags on that long! I am aiming to buy a desert island, get all my friends together and live a decadent and debauched retirement of alcohol and a lot of numbing substances, having a lot of funeral pyres cast out to sea as we all pop our clogs with big celebratory parties……I think death needs to become more punk……..more like the Burning Man festival but for pensioners. Right off to Bognor…where someone has had to drop out of a show, I am standing in. This also gives me the chance to learn a script for a screen test, study my subject for Mastermind and run the tour songs…….. yes my life as an artist now takes shape in the two hours I have alone in the car! See you out there. 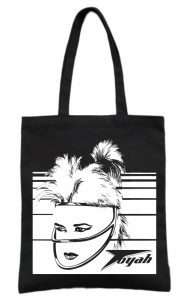 The shows will be PURE TOYAH.